A nonprofit, Catholic healthcare giant makes hundreds of millions in profits, raises the salaries of corporate executives and asks workers earning $31,000 a year to pay a $3,100 deductible for healthcare. So reads the Providence website. But ask the members of SEIU Healthcare 1199NW what they think of the five-state healthcare giant’s commitment to vulnerable workers, and they paint a very different picture. 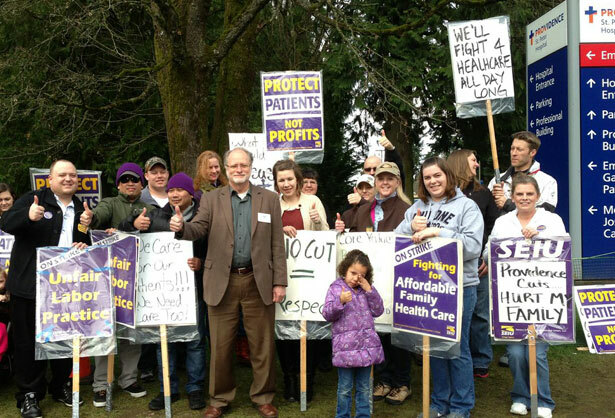 More than 700 union workers went on strike in Olympia, Washington, to protest the nonprofit’s unilateral decision while at the bargaining table to switch employees from an affordable healthcare plan to a high-deductible plan. These workers at Providence St. Peter Hospital—which include everyone but the doctors, registered nurses and social workers—and the Providence SoundHomeCare and Hospice earn an average of $31,000 annually. SEIU says the deductibles increased on January 1 from $750 to $3,000 for family coverage, and the workers face higher co-pays as well. The Segal Company, a benefits and human resources consulting firm, estimates that the workers will pay a total of $75,000 more in premiums under the new plan while Providence will pay $437,000 less. The lower a worker is on the wage scale, the more regressive the new healthcare plan is. The problem isn’t that Providence is lacking in resources: the company reported $286 million in profits in 2011, and the CEO’s compensation rose from $3.1 million in 2010 to $6.4 million in 2011; the senior VP and chief administration officer’s pay rose from $1.5 million to $3.3 million; and the executive VP, western Washington region, saw his pay increase from $2.4 million to $3.5 million. Providence claims that the high deductibles will largely be offset by payments to workers for participating in a wellness plan, resulting in net deductible increases of roughly $250 for individuals and $150 for families. But an SEIU source close to the negotiations says that the documents Providence is sharing with the union “show very different things than what they are saying in public.” Further, the wellness initiative was in place last year and only half of the eligible union members were able to meet the requirements—partly because the requirements kept changing, and partly because it was difficult for employees with irregular work schedules to meet with specific providers at prescribed times. This dispute is one that should be of concern not only to the SEIU workers in Olympia—and 6,000 SEIU hospital workers in Seattle with a contract that expires in 2015—but any employee who isn’t well off and in optimal health. High-deductible “catastrophic” or “consumer directed health plans” shift the cost of healthcare from employers to employees and are a permitted form of coverage under the Affordable Care Act. According to SEIU, companies that have moved all or most of their workers to these plans include: JPMorgan, Wells Fargo, American Express, Whole Foods and General Electric. According to Towers Watson and the National Business Group on Health, nearly one-fifth of large companies said that catastrophic, high-deductible coverage will be the only kind of plan they offer in 2013. Studies show that lower-wage workers in these high-deductible plans often skip necessary treatment in order to avoid high out-of-pocket expenses. A 2011 Rand study found a marked decrease in preventive care such as childhood vaccinations, cervical and colorectal cancer screening, and routine blood tests for people with diabetes. Even when catastrophic plans waived the deductible for preventive services, people in these plans still cut back on such care, fearing that a diagnosis would result in further expenses that they wouldn’t be able to afford. In fact, a Kaiser Family Foundation study found that people covered by catastrophic plans were twice as likely to report going without needed medical care as those in other health plans. It’s not only the patients who suffer under this approach, providers also often take a hit. Ellis Medicine is the largest provider of hospital services to General Electric workers and retirees in the country. As of June 30 of last year it had reported $7.8 million in bad debt, up $1 million from the year before. “My guess is that we are seeing more bad debt coming through our ER because of high deductibles,” Ellis Medicine CEO James Connolly told The Business Review. SEIU says that there is a much better alternative for workers and providers. The union also represents registered nurses at Group Health, a local HMO that has come out against high-deductible plans. When Group Health needed to reduce employee healthcare costs, it joined SEIU in developing a wellness initiative to focus on smoking cessation, weight management and chronic disease management. The result is that healthcare inflation was held to a total of 4 percent over four years, and last year healthcare costs actually went down. I won’t be posting the next two weeks because I’m taking time off to hang with my 1-month-old daughter, #BabyGracieRocks. Please comment below or email me at WeekInPoverty@me.com. I hope to post some of your responses in a future blog. The Coalition on Human Needs (CHN) now offers a weekly summary of the effect of sequestration on vital programs that many of you care about—from education and family services, to housing and senior services, and more. The first report includes an item on Head Start in Columbus and Franklin, Indiana, where 36 kids weren’t allowed to return to the classroom after March 15. The cities used lotteries to choose which children were permitted to remain in the program. Some Republicans in Congress, including House Budget Chair Paul Ryan in the budget proposal his committee released this past week, have called for radically restructuring federal assistance programs that they term "welfare"—including Food Stamps (SNAP), Medicaid, Social Security Disability Insurance (SSDI) and Supplemental Security Income (SSI). They propose building on the so-called "success" of "welfare reform," which in 1996 converted Aid to Families with Dependent Children (AFDC) into Temporary Assistance for Needy Families (TANF), a block grant program with strict time limits and work requirements that today serves a minuscule share of families in need. TANF has proven to be significantly less responsive as an anti-poverty program than its predecessor. For every 100 poor families with children, today just 27 are helped by TANF—down from 68 in 1996. The number of poor families with children helped by TANF actually declined during the recent economic downturn, which saw a huge increase in deep poverty. For those lucky enough to receive TANF, grant amounts are equal to just 30 percent of the federal poverty level (less than $5,500 per year for a family of three) in most states. The claim that the decline in TANF enrollment is due to an upsurge in work among single mothers is flatly contradicted by the data. While the booming economy of the 1990s and early 2000s led to low unemployment and a decline in poverty, those gains have since vanished, and the share of single mothers with a high school diploma or less who are working is now back to where it was in 1996, at about 62 percent. But facts haven't kept Republicans and even some Democrats from declaring welfare reform a "success" worthy of building on. Those who call for this sort of overhaul of SSDI and SSI say they believe that most working age people who receive disability benefits could and would work if faced with the "right" incentives. The truth is SSDI and SSI beneficiaries have severe impairments and health conditions that keep them from being able to work enough to support themselves. Many are terminally ill: one in five male beneficiaries, and one in seven female beneficiaries, die within five years of receiving benefits. Most applications for benefits are denied and less than 40 percent are approved under the strict disability standard. Benefits, while inadequate for many, are vital. The average SSI benefit was just $520 per month in 2012—about half the federal poverty level for a single person, and just $17.33 per day. The average monthly SSDI benefit was about $1,100 in 2012, just over the federal poverty line for a single person—but a full quarter of SSDI beneficiaries live in poverty and the majority are low-income (below twice the federal poverty level). For most adult disability beneficiaries their SSI and SSDI benefits make up all or most of their income. These benefits keep millions of people with disabilities out of deep poverty and homelessness. As with the adult disability programs, most children who apply are denied SSI, and only the most severely impaired qualify for benefits. Just 1.6 percent of US children receive SSI—compared with the estimated 9 percent who have severe disabilities. Benefits are modest (on average $619 per month for 2012) but together with Medicaid make it possible for many children to remain at home with their families instead of in an institution. Nearly half of children receiving SSI live with a working parent, yet many parents of children with disabilities are unable to work full-time due to caregiving responsibilities. SSI replaces some of the income lost when a parent cuts their hours or loses a job after one too many missed work days to care for a sick child. It also covers some of the family's out of pocket medical and disability-related expenses, many of which are not covered by Medicaid. Unfortunately, research on the work capacity of adult disability beneficiaries is often mischaracterized. Studies are frequently described as finding that some current beneficiaries "could work," though a closer look reveals that the earning potential of that subset of beneficiaries who "could" or "should" be working is a few thousand dollars per year—hardly enough to support oneself. Proposals to "reform" SSI and SSDI in the same way that "welfare reform" created TANF would be nothing short of devastating to children and adults with disabilities. Work requirements have no place in programs that—by definition—serve people with disabilities so severe that that they are unable to work enough to support themselves. They also have no place in the SSI children's program, whose purpose is to supplement family income when caregiving responsibilities prevent parents from full-time work. Moreover, the TANF experiment has shown what block-granting does—it weakens vital programs and makes them far less effective at increasing economic security for the people they’re intended to help. If there’s a lesson to be learned from welfare reform, it’s that we can’t afford to make the same mistake again with other vital programs. Rebecca Vallas is a staff attorney and policy advocate at Community Legal Services in Philadelphia. She is a co-chair of the Consortium for Citizens with Disabilities (CCD) Social Security Task Force and co-leads the SSI Coalition for Children and Families, a group of over 100 organizations working to preserve and strengthen SSI for children with severe disabilities. Asset Limits: Many public benefit programs—like TANF, Medicaid and food assistance—limit eligibility to those with few or no assets. Nine states introduced legislation to eliminate asset tests (Hawaii and Illinois, for example) or exclude certain kinds of assets such as automobiles from being counted (California and Massachusetts, for example). Minnesota’s Department of Human Services offered the state legislature policy options for simplifying or eliminating asset limits across economic assistance programs. For more information, read this blog post. Payday and Auto Title Lending: Texas, Alabama, New Hampshire and New York introduced legislation to regulate payday and auto-title lending. Unfortunately, North Carolina is considering reversing a 2001 ban on payday lending, which would allow short-term, high-interest lenders to return to the state. Earned Income Tax Credit: North Carolina’s Senate voted to eliminate the state’s EITC and Connecticut’s governor proposed a budget reducing the credit from 30 percent to 25 percent of the federal credit. In better news, New Jersey’s General Assembly voted to fully restore the EITC and the Michigan Senate introduced legislation to restore the credit to 20 percent of the federal credit. Individual Retirement Accounts: Illinois lawmakers introduced legislation to create retirement savings accounts for workers. Sign on to support the bill here. Individual Development Accounts: IDA programs consist of matched savings accounts that enable low-income families to save, gain assets and enter the financial mainstream. Indiana’s proposed state budget would cut IDA funding in half from $1 million to $500,000. Indiana Institute for Working Families is pushing the Senate Appropriations Committee to restore funding. The New York City Coalition Against Hunger is spearheading a new long-term, nationwide initiative to redefine the way people think and act when it comes to volunteering to fight hunger. As part of that effort, the organization will co-sponsor a conference in Dallas, Texas, with the North Texas Food Bank, Texas Hunger Initiative and USDA Food and Nutrition Service: Friday, March 22, 9 am–4 pm (Wilshire Baptist Church, 4316 Abrams Rd, Dallas, TX 75214). More information here. This documentary about eight families in Portland struggling through the recession is a must-see, and it premiers tonight on HBO. Thanks to host Economic Policy Institute (EPI) and cosponsor The Nation for last week’s screening and terrific panel discussion that included filmmakers Joe and Harry Gantz, two families in the film—Diedre and Jalean, and Brandon, Pam and Jude—and policy experts Elaine Weiss, Algernon Austin and Mariana Chilton. “Out of Reach 2013,” Elina Bravve, Megan Bolton, Sheila Crowley, National Low Income Housing Coalition. The number of households that rent instead of own their homes rose by one million in 2011—the single largest one-year increase since the early 1980s. Though renting can be cheaper than buying, renters are finding it increasingly difficult to make ends meet. This report estimates a 2013 “housing wage”—that is, what a household would have to bring in to afford a decent apartment at HUD’s Fair Market Rent, while spending no more than 30 percent of income on housing—of $18.79. The average hourly wage of renters, though, sits at $14.32. Why the gap? The report cites a number of factors: rising rents, stagnating wages and a shortage of affordable housing units. The biggest solution, it says, is to expand the supply of these units—on the order of 4.5 million—to meet the demand from extremely low-income households with incomes at or below the regional median. “Family Independence Initiative: The Role of Control, Options, and Social Connectedness in Economic Mobility for Families,” Melanie Moore Kubo, PhD and Suki McCoy, See Change. Through the Family Independence Initiative (FII), families meet regularly for mutual support and have access to a resource bank for various financial and social tools—creating what FII calls “environments of opportunity.” This independent study looks at Boston families who worked with FII over the course of two years. The study shows a slate of positive results, including: half of families who lived below the federal poverty line had risen above it in two years; earnings rose 27 percent; savings rose 187 percent; and 91 percent of families (compared to 27 percent at the outset) reported that they could count on others in their community for support. “Putting Sustainability on the Table: Airport Workers’ Vision for $3 Billion of Food and Drink at O’Hare,” UNITE HERE! At O’Hare International Airport, the second biggest airport in the country, the City of Chicago is set to give away $3 billion in contracts to food concession companies. For this report, UNITE HERE—which represents workers in the hotel, gaming, food service, manufacturing, textile, distribution, laundry and airport industries—surveyed workers and customers on the guidelines that they’d like to see the city set for the food and work that is on its way to the airport. Among other things, surveys reveal that 78 percent of passengers and 89 percent of workers would like to see food cooked from fresh ingredients, and 89 percent of workers think there should be more food service training opportunities to step up the job ladder. The report offers a variety of recommendations for O’Hare moving forward: requiring bidders to provide plans for fresh cooking, local produce purchasing and disposal management; ensuring every outlet includes healthy options for a variety of diets; requiring job stability for existing airport workers; and investing in a worker training program. Households with children in large cities that are food-insecure: 25 percent. People experiencing homelessness on any given night, US: 643,067. “There’s a 6-foot cement wall between people in Congress making the major policy decisions, and the rest of low-income America. Low-income Americans have practically no way to penetrate the workings of Congress, to express their opinions and to be taken seriously. In addition, people in Congress cannot and do not seem to try to understand what’s really happening on the ground with their policies. —Dr. Mariana Chilton, Center for Hunger-Free Communities, at EPI/Nation screening of American Winter. James Cersonsky wrote the “Notable studies” summaries and co-wrote the “Clips” section in this blog.